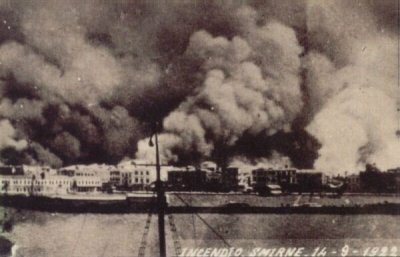 On September 13, 1922, fire broke out in the ancient city of Smyrna (İzmir), days after Turkish Army forces had entered the city, ending the Greek occupation of western Anatolia after World War I.
Greece, as part of the postwar occupation of Ottoman territory under the Treaty of Sèvres, had landed troops at Smyrna in 1919, and occupied parts of western Anatolia. Turkish forces under Mustafa Kemal challenged them in the 1919-1922 Greco-Turkish War, which effectively ended on September 9, 1922, when Turkish forces occupied the city. Four days later, the Great Fire broke out, burning until September 22. By the time it was over, the Greek and Armenian quarters of the ancient city had been destroyed and Greek and Western ships evacuated tens of thousands, perhaps hundreds of thousands, of refugees, including a young Aristotle Onassis. Beyond that, there is little agreement on anything. Estimates of Greek and Armenian deaths range from 10,000 to 50,000 or more, estimates of total refugees as high as 400,000. Greeks, Armenians, and most but not all Western historians blame the Turkish Army either for setting the fire or not extinguishing it once it began; most Turkish sources blame the Greeks and/or Armenians. What is certain is that without Western military support, the quixotic Greek attempt to occupy Western Anatolia was probably doomed, and Smyrna's history as a Greek city ended in the flames of 1922.